As professional Port Macquarie to Cairns removalists, it is our foundation of knowledge & experience that gives us the ability to satisfy every clients requirements from start to finish, whether it is furniture removals, vehicle transport, your delicate piano or back-loading removals. to Cairns and found your website, Roadways Removals, when searching online for a decent company to look after us. The quote for our move was great compared to others and the guys in your office were very helpful. The furniture removalists were awesome with the pickup and delivery of our furniture. Everything went smoothly and according to plan. Thank you so much Roadways Removals for looking after us so well. 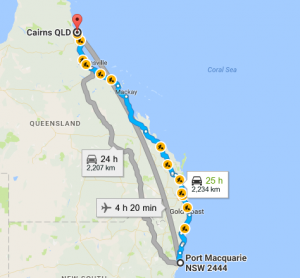 It is for this reason that our Port Macquarie to Cairns removalists continue to excel and why Roadways Removals is the best choice as your interstate removalists.